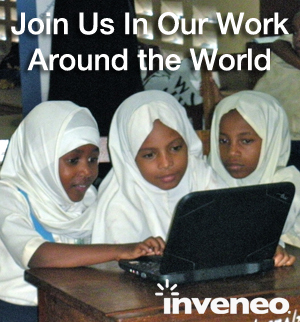 Inveneo is a non-profit social enterprise that delivers the tools of technology – sustainable computing and broadband – to those who need it most in the developing world, to transform lives through better education, healthcare, economic opportunities, and faster relief. Inveneo believes that improved access to technology can transform lives and opportunities even in some of the poorest and most technology challenged communities in the world. But technology is not enough – the right approach is critical for long term sustainability. With deep technical expertise, a firm understanding of the challenges endemic to the developing world, and local partners by their side – Inveneo gets results. Integral and unique to our approach are two key themes: local capacity building and knowledge sharing. In each country where we work, Inveneo is building capacity with local ICT entrepreneurs through training, certification and entering into long term partnerships to identify and deliver sustainable projects in challenging environments. We now have a strong ecosystem of 120+ partners designing, implementing, and supporting information and communications technology (ICT) projects in more than 20 countries – a unique approach strengthens local capacity and ICT sustainability. This approach builds new market opportunities for entrepreneurs, local ICT jobs and expands our impact far beyond Inveneo’s direct reach. We are as committed to building a global community dialog among ICT for Development (ICT4D) experts, as we are developing local in-country deployment experts. ICTworks by Inveneo, is a vibrant community to share ICT4D best practices and information to improve sustainability and community impact of all technology programming. Through the Technology Salon We are now leading a curated a global discussion to help the international development community explore the many answers to the question, “How do we use ICTs to drive accelerate community and economic development and drive better use of development funds overall?” In addition, we organize other events and discussions as needed to keep the conversation lively and relevant. To experience the Inveneo difference in your programming, connect with us now.